Earlier in this semester I felt a deep call from the Father saying that he wanted to transform me, and specifically to transform me into the man that He intended me to be. I didn’t know what he would do, or the way that he would reveal himself to me… but I knew He was at work within my life and within my heart whether I accepted it or not. A month into the semester I was actually confronted by one of our missionaries here at UCF and had mentioned of this men’s trip to North Carolina, and how we would work hard at farms and grow in brotherhood. It sounded tempting and like something different, but I didn’t know if it was truly something for me. It wasn’t until we were drawing closer to the deadline of registering for the event that I asked the missionary to send me some details of the event so that I could fundraise and talk to people about this trip. And he managed to send me a schedule of the previous trip that had been made the year before. I remember the first thing I noticed when reading that sheet…and it couldn’t have been any clearer… “Achieving Manhood in Christ”. And without much hesitation I said, yes. And I gave this yes, because I knew that the Father wanted to do something special within my heart something that only he could do in me through the presence of being with other men and serving Him during this one week. During my trip to North Carolina I was fortunate enough to meet true men of Christ. But one in particular goes by the name of Jason Craig. It wasn’t his farmer fit or his bush like beard that made him a man, but it was something more. And this something more was this constant desire to serve his family, serve his vocation, and those around him through our Lord Jesus Christ. I remember one of the days when we're out in the farm. And I remember after working out in the fields, having dug up holes and made fences we were having lunch. And our lunch for the whole week consisted of a handful of pretzels, one apple, and a Pb &J sandwich. To say the least this was not enough for me. But this one day I remember Jason coming out and joining us for lunch, and he pulled out one apple and a small jar of peanut butter. And I remember his kids being with him and they were also hungry. And what he did next just put me straight. He cut this one apple into small slices, placed a bit of peanut butter on each and handed one slice to each of his kids before he, himself having one. I remember saying…WOW…this man is a clear example of what it means to be humble. And there I sat complaining about my peanut butter, complaining that it wasn’t enough, that I wanted more. And on top of that whining about my back hurting and my knees aching. I remember Jason telling us earlier that day that there were times when he would wake up, and he would either be sore from the day before, or would be so tired that he just wanted to stay in bed. But deep inside he knew better that he had to wake up, he had to take care of his farm and his family. In doing so, he was serving his family, and serving in the most beautiful way possible which is through love and the ability to sacrifice one’s own desire for the sake of another. This being his family and the vocation that the Lord had called him to. “Men, you are probably wondering why I brought you out here”. “We are here to get uncomfortable”. This whole trip, my whole relationship with Christ has been a constant, yes. This yes, to Him allowed me to be in contact with 35 other men who I know call brothers. This yes, to answer to the call of achieving manhood in Christ, opened me to a truth that is hard to see because unfortunately our society tries to define what a ‘real man’ is. What I came to realize is that a man who seeks full maturity in Christ is a man who is on fire for the Lord, it is a man who doesn’t give 1/3 of his heart to the Lord, but instead gives ALL of it. It is man that sacrifices, that is vulnerable, that is a leader, that is willing to be uncomfortable, and most importantly that loves the way that Christ loves. Almost 200 students filled the great room-turned-chapel on the weekend of February 9, for the Catholic Student Union (CSU) of Florida State University’s 2018 spring retreat. Regardless of the details of how we all arrived at the campground, we were all there for the same reason: God called us, placed us on this retreat. Over the weekend, we dove into God’s power, His dunamis, and its role in our everyday lives. From both talks and witnesses, I learned about the Holy Spirit and His burning desire to strengthen us to live in the Kingdom of Light. Friday and Saturday night culminated in Adoration and a chance to pray for Baptism in the Holy Spirit, during which I repented from my sins and opened my heart to the Father so that He could fill me with the graces, gifts, and powers of His Spirit to help me live an abundant, joyful life set apart for Him. The Lord reminded me how much He wants me to trust in Him and give Him my whole heart. Instead of living a self-empowered and independent life, He wants to give me his dunamis – his Holy Spirit – to free me to live a life for Him so that I can more freely love and be loved. He asked me to surrender to Him and trust in His plan for me, reminding me that He holds my life in His hands and would never hold back a joy-filled life back me. While I have to take up my cross to follow Him, He will always provide an abundant life for me. On the last day of retreat, we learned about being a follower, not just a fan, of Jesus. The Lord gently reminded me of the healthy detachment I must have from the things within my life – my “nets” that hold me back from trusting Him with my whole heart. I grew in faith, love, trust, and community that weekend. Journeying with my small group, worshipping with other members of CSU, and having deep one-on-one conversations with other students all brought me into a closer relationship with the Lord. Opening my heart to Jesus and enthroning Him as the King of my heart launched me back into my spring semester and continues to encourage me to pursue a deeper relationship with Him. The first thought for a college student is generally ladened with relief because of the extra day off of school. At our SPO chapter at UCF, a group of 11 men were anticipating adventure. Thanks to our partnership with Barbasol we left Orlando on Thursday evening, and arrived Friday morning in the Great Smoky Mountains. Before even going to our campsite we went to the highest point in the mountains and walked up to the observation post. After a brief meeting we split off in the woods for prayer time. In a sense this weekend was a retreat in the truest sense of the word. It wasn’t a retreat filled with all sorts of programming, but a retreat from the busyness and distractions of life; a retreat to the beauty and friendships that make life rich. From the grueling 5.5 mile summit hike, to the laughter around the campfire and to the times of prayer, we experienced God drawing us together. and this is what we’ve seen from this trip. The friendships and brotherhood that were given the opportunity to blossom through this trip have continued deepen immensely, and bear much fruit! For the first time ever, the Catholic Student Union at Florida State University has its first Men’s Household up and running. As the Household Leader, I have had the privilege of setting the groundwork with the men I’m living with for years to come. The opportunity to have a place and space to run after Jesus Christ day in and day out at FSU is a great addition to the overall mission of the Catholic Student Union. Household life adds a versatile dimension to the communal, prayerful, and social aspects of the greater community. Some aspects of Household that have made it a great place for fellowship, discipleship, and fun have been the common times we spend together throughout the week. Every Monday and Wednesday we take time for family meals. We have a family style dinner on Monday evenings and a family style breakfast on Wednesday mornings. During these meals we take time to reflect on the week, “bro-out” (mess around and talk about nonsense), and also dive into a deeper topic of discussion that varies each week. This past week we dove into the question, “How are we to be led by the Holy Spirit in order that he may form us as sons of God?” With questions like these, we dive into the heart and explore the great love and commission God has for us to live boldly and radically for Jesus! But this depth of love for the Lord isn’t limited to meal discussions; it’s actually fostered in the time we take to pray together. Twice a week on Tuesdays and Thursdays we get up at 6:30 a.m. to pray Morning Prayer. This consists of praying with the Psalms and worshipping the Lord in song for a total of 45 minutes. These rich, early morning times of prayer before classes begin the day on the right note as we give our first-fruits of praise and worship to the Lord. They fuel and sustain us throughout the week and help us to remember to keep God first throughout our days. Along with growing in holiness, we men in Household have grown in deeper fraternity with one another. As we live in close physical proximity together, opportunities for authentic and meaningful relationships are common and have a rich soil to take deep root. Whether we are playing chess, cooking lunch, playing guitar, or doing homework, being in communion with one another throughout the day has helped us to deepen our relationships by building trust and having fun with each other. Living together has also taught us how to patiently bear one another’s faults and flaws. Overall, Household life has been a fruitful experience where we have encountered deeper growth together than we could have experienced living alone or in a different setup. As Thomas Hammen, a junior living in the house, puts it, “Household life has shown me the depths of brotherhood available to us if we only include in our friendships Jesus Christ!” It is clear to me how we are growing in holiness, community, and going out on mission to spread the love of Jesus Christ together as we press on through the school year. I am so excited to keep running with these men and look forward to the adventures that our Father, God, has in store for us. Please keep us in your prayers and may God bless you! 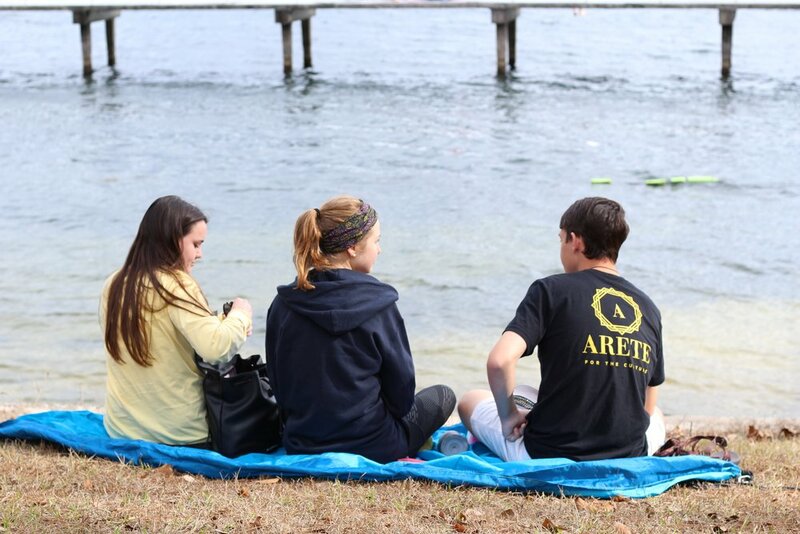 Aimee Ellis and Curtis Okolovitch reflect on UCF's spring break service trips. Read about the women's experiences in Trenton and the men's adventures in Detroit here! The Knights charge out of the doors of CCM to March for the Lives of the unborn. Read about why marching for those without a voice is so important to the students in the CCM community. Do I have what it takes?" John Eldridge, author of the book Wild at Heart, says this is the question that haunts every man. It strikes at the core of his identity as a son of God. At the Catholic Student Union at Florida State, we want men to know that they do have what it takes. Coming to UCF 2017: SPO's Household Program! Mission Leader Sofia Fernandez reflects on the progress made towards establishing Households for the 2017-2018 school year. As the year closes, students have begun the application process to live out Christian life through the pillars of mission, community, and holiness. The first group of Mission Leaders on UCF's campus reflect on the good work the Lord has done on campus and within their hearts in this first year on mission in Florida. Eight year veteran of campus ministry, Tony Marco shares his experience serving the students of the University of Central Florida and his hopes for the future of the ministry in this new collaboration between SPO and BOH. After a long first half of the semester, thirteen from the women's community served the elderly poor with the Little Sisters of the Poor in Mobile, Alabama. This almost week-long trip proved to be a huge blessing, for the residents, sisters, and students. Our students went Beyond the Limits as they journeyed through our Spring Retreat. This retreat, directed by student leaders Julianna and Chris was an impactful weekend dedicated to the Lord. Walking side by side with St. Josemaria Escrivá, the patron saint for this retreat, the students learned what it means to strive for holiness in everyday life and how to do it! Momma Mary, Lead Us to Jesus! What was Mary's role in salvation history? How does she continue to play a role in our faith life as Christians? Last week's Knight Fire topic explored the role of Mary as Mother of God and how she leads us to Christ! A look at our weekly gatherings, where the Catholic Campus Ministry comes together as a community to pray, learn, and grow in our faith. This article covers what a typical "Knight Fire" usually entails and gives some insight into our patron saint for the year. Pro-life & Pro-woman: March for Life 2016! Seventeen from the Catholic Campus Ministry at UCF travel to Washington, DC to participate in the largest pro-life event in the world: the March for Life. Despite the approach of a massive blizzard, these students persevered and prayed in front of Capitol Hill for an end to abortion! A meeting with the bishop provided a time and space for the Mission Leaders at UCF to share how Christ has impacted their lives and how they are bringing the Catholic faith alive on campus. The women of the Catholic Campus Ministry explore how they themselves were created for "great things" in Christ Jesus! As part of the women's group, students have an opportunity to be formed in the teachings of the Catholic faith and relate with one another as they strive for holiness in their everyday life.